Background: Excessive alcohol consumption damages the intestine and liver cells directly as well as through unbalancing the gut microbiota. Objective: The current study was undertaken to correlate the alcohol consumption and change in urinary metabolites profile linked with gut microbiota. Method: Non-alcoholic (control) healthy (n=22) and moderate alcoholic (n=26) males with an average age of 39.3±1.83 years subjected to alcohol use disorders identification test (AUDIT) were considered for study. First pass urine and blood samples were collected in the morning. Results: Liver function test showed the increased levels of γGT, AST and ALT to 40.3 ± 2.3, 53.3 ± 0.7, and 38.9 ± 0.5 U/L, respectively. Urine samples were processed and subjected to HPLC-Q-TOFMS analysis in positive and negative ion polarity modes. Mass data were processed to align and filter out insignificant entities and subjected to One-way ANOVA with Bonferroni multiple testing corrections analysis. The analysis provided list of 211gut microbes specific metabolites with p>0.05 and fold change >1.5. 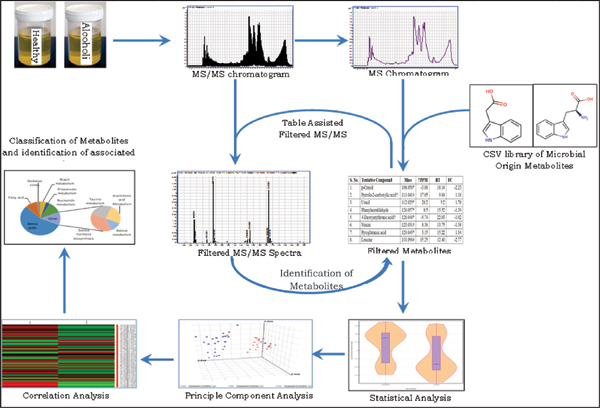 All metabolites were identified using standards and referring to METALIN library of standard metabolites. Further analyses showed that alcohol intake disturbed more than ten metabolic pathways. Tryptophan, tyrosine, branched chain amino acids and short-chain fatty acids metabolism were the significantly disturbed pathways in alcoholics. Conclusion: Correlation of various metabolites with gut microbiota showed that chronic and moderate dose intake of alcohol decreased the level of Bifidobacterium, Lactobacillus Ruminococcus and Faecalibacterium spp. and increased the levels of Proteobacteria, Alcaligenes and Clostridium. Keywords: Gut, microbiota, alcoholics, metabolites, amino acids, HPLC-Q-TOF-MS.
Keywords:Gut, microbiota, alcoholics, metabolites, amino acids, HPLC-Q-TOF-MS.
Abstract:Background: Excessive alcohol consumption damages the intestine and liver cells directly as well as through unbalancing the gut microbiota.